"We all have memories of a special holiday or Christmas. The little girl in my painting will always remember this Christmas and her favorite gift. The holidays are a wonderful time of the year. I love the sounds and the smells and the expressions on people's faces. Everyone celebrates the holidays in their own way and in their own faith. It's a time for love and forgiveness, a time to reflect and a time to be with the ones we love." 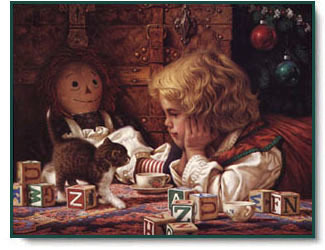 Favorite Gift copyright© 1992 by Jim Daly.